Investigate how paper chromatography can be used to separate and identify a mixture of food colourings. As a general rule, eye protection (goggles) must be worn for all practicals. This risk assessment is provided as an example only, and you must perform your own risk assessment before doing this experiment. Calculate how far the solvent moved, then calculate the Rf value of each spot. Compare the Rf values/colours of each spots in the different inks - what are the similarities and differences? Are there any other colourings in mixture U which do not match A–D? How do you know that a chemical is pure from chromatography results? Are there any other ways that chemists use to ensure that a substance is a pure substance? A new type of waterproof pen has just been released, and it contains ink that is insoluble in water. A company suspects it may be a copy of their pen's ink. Describe how they should use paper chromatography to identify whether the inks are the same. Place a spot of the new pen's ink from the pen on chromatogaphy paper, and place a spot of the original ink on there too. Hang the piece of paper in a beaker, and add a small amount of solvent (not water, e.g. ethanol) as to not cover the pencil line. Allow the solvent to rise up the paper. 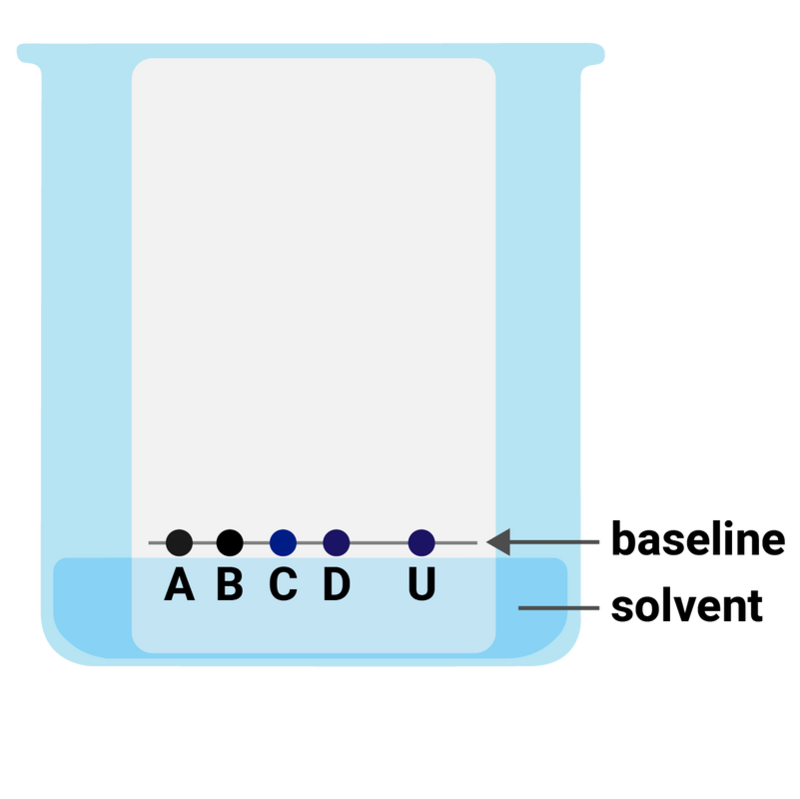 Draw a line (in pencil) across a piece of chromatography paper, about 1 cm above the bottom. Place a spot of the new pen's ink from the pen on the pencil line, and place a spot of the original ink on the line. Measure how far the solvent moved, as well as each spot on the chromatogram, and calculate the Rf values of each spot. If the Rf values match, then the ink is a copy.